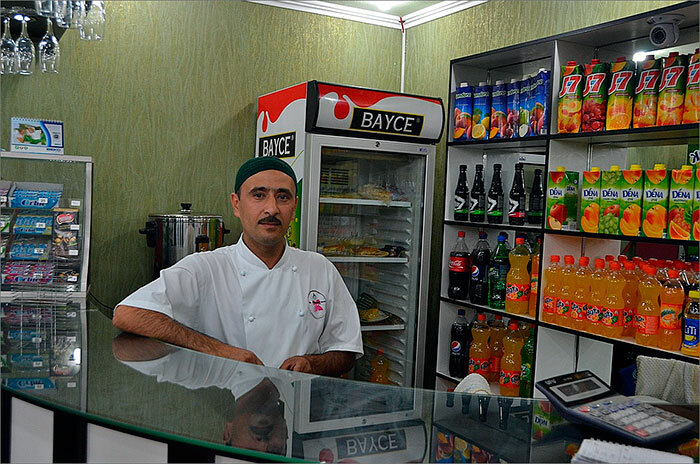 Ismail is a cook at Kumush Café, who prepares hamburgers. In his free time, he writes songs hitting top of charts at a local radio station. 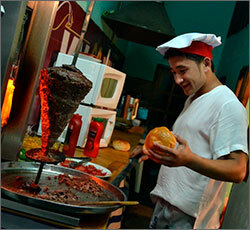 Kyrgyzstan’s southern capital, the city of Osh, is known for its national cuisine and cooks. Only in Osh one would eat the world-renowned baked samsa, pilaf, lagman and a variety of shish kabobs and mantys. While the locals are, of course, well aware of the local foods, tourists find Osh’s “sweet spots” in its cafes and restaurants. Shahid Tepa is a heavily Uzbek-populated neighborhood in Osh. Owners of two local cafes decided to diversity their menus and add “Western flavor” to their traditional pilaf and shish kabob. The Good Food Café opened its doors to customers in March 2013. The master chef Rustam Haliljanov told Fergana that before opening this café, he worked in different restaurants in Saint Petersburg, Russia, for 18 years. “I was born and raised in Osh and I like the national cuisine a lot. However, there are a number of different cafes that serve samsas and pilaf. So I wanted to introduce something new. Obviously, youngsters in Osh have heard about McDonald’s and the like, but no café around here offered such meals. We have, therefore, decided to open a café which would serve foods similar to “Mc’s,” yet with the local flavor,” he says. The café has two halls each capable of hosting up to 40 customers. While one of them is open for quickly taking a bite on a hamburger or a pizza with drinks, the other one is reserved for full course meals. You could order a fish steak, chicken wings, the popular Cesar salad, and a cheesecake and other sweets for the dessert, which are quite exotic European meals for Osh. By the way, the chicken wings are the most popular among local consumers. “No, I don’t want to return to Russia. I am happy with the salary here; besides I don't have to obtain employment authorization or pay rent,” Rustam says. He has sent his own son to fill in for him in the restaurant in Saint Petersburg, where one of his students is the master chef. I have personally tasted the fish steak and chicken wings and I can attest that they are on par with restaurants in the capital city of Bishkek. I have also learned, once again, that Uzbek cooks can cook not only the best pilaf in the world, but also tiramisu, cheesecakes and a number of other “European” desserts. According to Rustam, the confectioner in his restaurant is another native Osh resident, who learned cooking such desserts in restaurants in Russia. 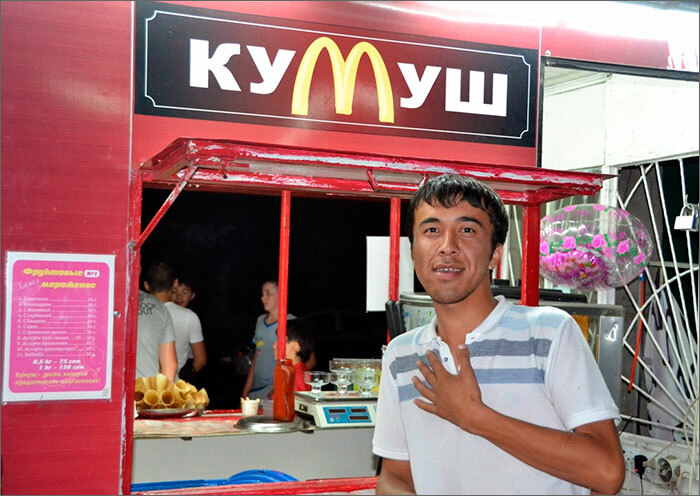 The other café I visited—Kumush, whose large M reminds the McDonald’s chain’s golden arches—is also located in this Uzbek-majority neighborhood. It opened its doors over two years ago. “I had a hamburger in the outskirts of Osh and thought that I could actually sell them in my mahalla [Uzbek: neighborhood],” Zokhid Hasyljanov, the owner of the joint, told me. Although he was then engaged in car dealership, he rented a facility and learned making hamburgers. Now that his joint is popular, he can afford to hire more people. The cook he hired has also spent many years in Russia. But a different person cooks those tasty and juicy double and cheese hamburgers—a young man named Ismail. He cooks over 300 hamburgers between 9AM and 11PM. But that is not the only feat he is good at—he composes songs, which are on top of charts of Uzbek songs at a local radio station. Because he is relatively well-paid at 700 soms (over $15) a day, he can afford to engage in this “costly” creative work. Zokhid fell short of making his menu completely “European”: for instance, he left shish kabob, which will perhaps always be on demand in the south. 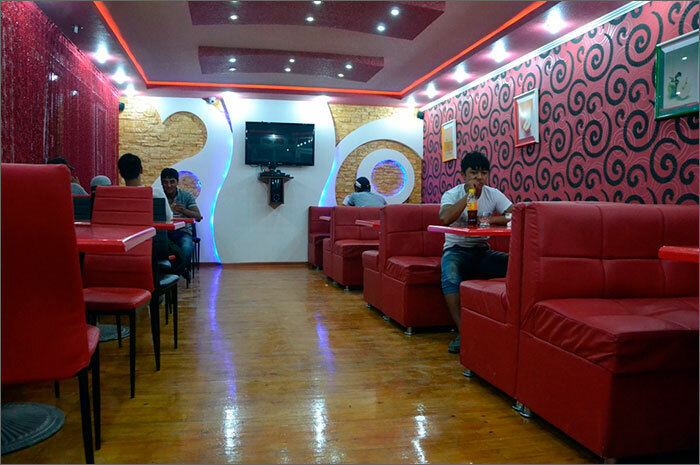 Both joints are very popular in Osh: they are full with customers in evenings, who often take-out. People often come here for a pleasant pastime with friends. Locals bring foreigners to show “McDac Osh style” and treat them with a lunch cooked with organic ingredients. Such a lunch, by the way, is quite affordable: two persons could spend about $10-15, including dessert.